Chronicle Crew, It’s What We Do! Have you ever wondered what happens behind the scenes of some things? Well, today is your lucky day! I will tell you about all of us Cushman Chroniclers and how we do our job. 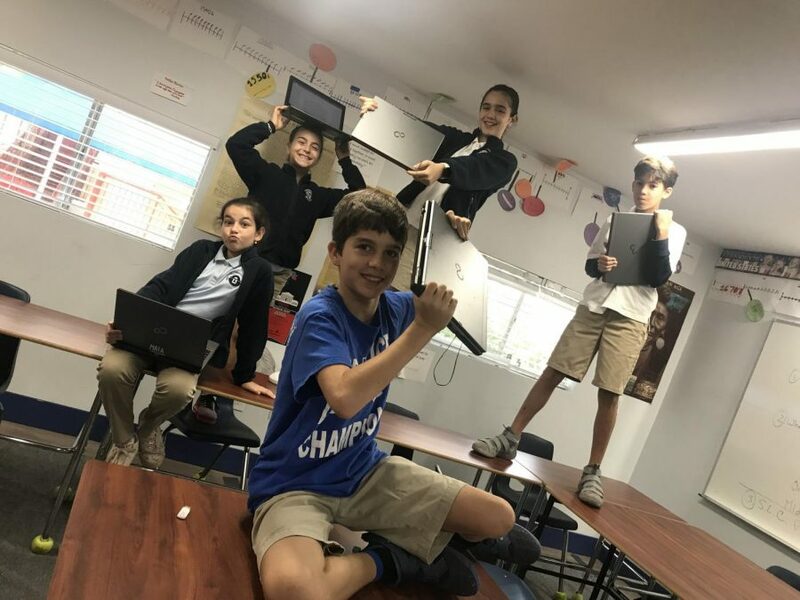 We know that we have a lot on our shoulders, after all we are the first student news reporters at the Cushman School and we want to build our reputations among students, teachers, and parents. But, we also want to present interesting and imaginative articles, that people would read willingly. You would probably think that that’s a difficult task but, it really isn’t that hard. There are just a few simple steps to writing good articles and to being good journalists but the thing that’s most important to our job is delivering reliable facts. Our jobs are a lot easier with Mr. Perez being there! He gives us great ideas on things to write about and gives us useful tips and approaches on how to write them. And, if you didn’t already know, Mr. Perez is a former journalist who used to work at Channel 7 News, so writing is naturally in his blood. When we arrive at journalism class in the morning, we always have something to work on and boy, do we work on it. However, we still laugh and sometimes chit- chat. I mean how can’t you, with such a funny crew? Our Chronicle Crew includes Jalen Kotalik, Marcos Rodriguez, Luna Molla, Maia Marcoschamer, me Jasmin Rossi, and best of all, Mr. Perez! I find that we’re probably the most creative Crew in the world. And everyone has a favorite topic to write about, which makes it great for the Chronicle and all different sections of it. Once we have an article idea, we simply write about it. Sometimes we have to ask questions, interview people or research things, but it’s always super fun. Journalism isn’t like writing an essay in English, not at all, it’s more like expressing yourself with words and phrases. Words are like clay and stone, you sculpt them to express yourself, and you learn that in this class. This is what I love about Journalism, learning how to express myself in a different way, with words and phrases. And you know, it’s never too late to join the Chronicle Crew, or to check into our office in M16. Later Cougars! Lots of love from the Crew. The chit-chatting and laughing is a very accurate way to summarize what we do in Journalism lol! Our first year of Cushman Chronicles, I hope this becomes a tradition. You guys should get ID badges. Yes Mr. Martinez! That is a GREAT idea! Loved the article, but who is me? Great team! Keep up the good work! Have fun doing it! Fabulous Article Jasmin! What fun that is! good work at making these articles like the Santa and the Spain visitors and keep up the good work . The Truth: Who is Luna Molla? Sofia Besada, Who is She?